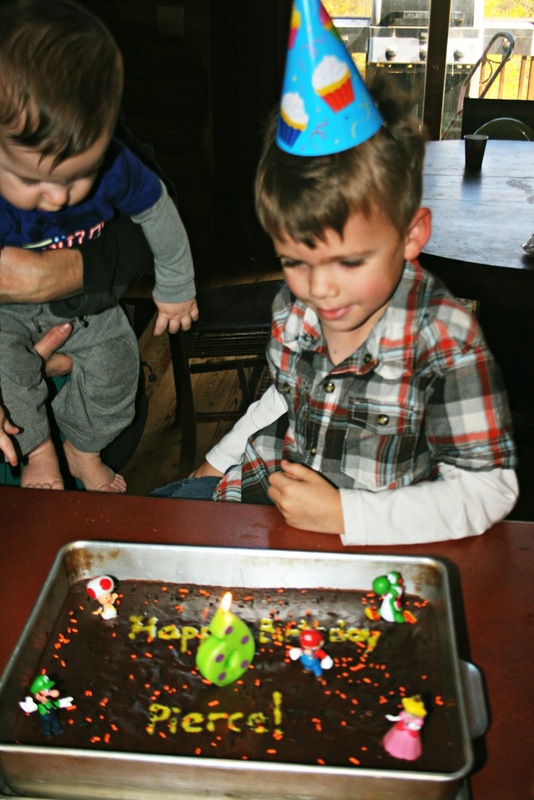 A couple of weeks ago, Pierce turned six. SIX. How do these things happen so quickly? Anyhow, he had a splendid get together with family which included a highly desired "Mario cake". What does a 6 year old little boy want for his birthday? Well Pierce wanted Lego sets, a light saber, an ice cream maker, a Harry Potter magic wand, and Vibram barefoot running shoes. Thanks to generous family, he either received or was able to purchase all of these items with birthday money! And what did he want from Paul and I? 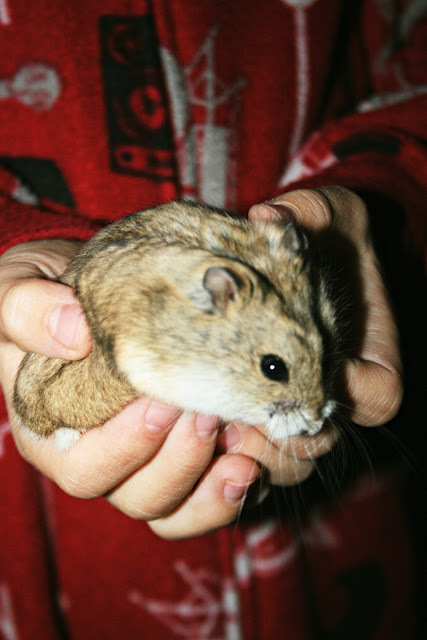 A hamster. He's been begging for a hamster since last summer! I thought maybe he'd forget about it by now, but nope. He named her Jubal. I have to confess - that furry, fat little body. Those perky and curious little ears. We're all just a little smitten by this cute creature. Including this guy. I see you Baxter. Don't even think about it! Awwww, just look at that smile! Happy belated SIXTH Birthday Pierce! Try not to grow up too fast, for your Mama's sake. Jubal...how appropriate, just look at the 'Jubal'ation on that wee face, hehe. Oh Jubal is very cute. We had hamsters when I was a kid and Guinea pigs. Wow barefoot runners I am excited about them too. Yeah sounds like fun. Awww So cute! And I love a Mario cake, brings me back a bit :-) My kids really want a dog, but I am trying to use the "chickens as pets" part of our chicken experiment to hopefully put them off until it gets warm again! He looks like a cute pet! I hope he remains in his cat free zone. 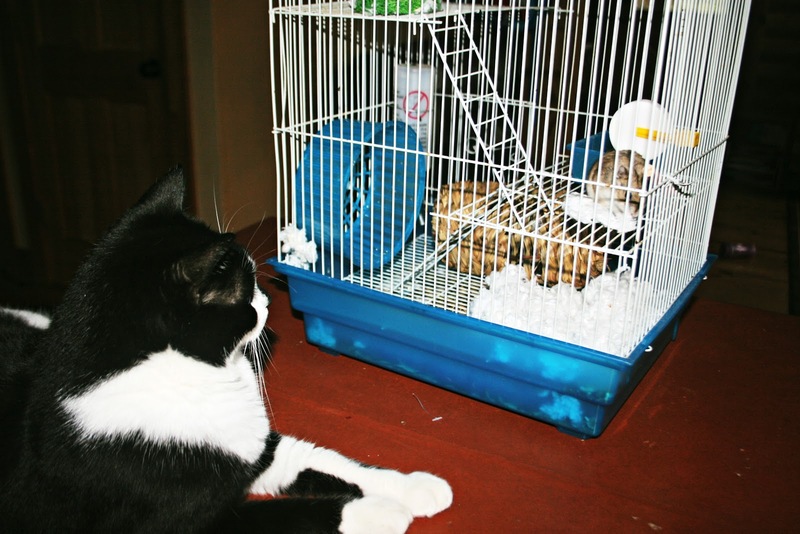 Hmmmm....didn't you get Baxter because he is supposed to be a good mouser? Maybe you should keep him in your car. I can see that Baxter is really excited! That picture was too funny! Happy 6th birthday Pierce! I'm glad he got what he wanted, but that's a little too mouse-like for my comfort! happy birthday pierce!! he and jubal are just adorable! Happy birthday, Pierce! I'm so excited for him for getting Jubal. Such a sweet picture of the two of them. And I like the photo of watchful Baxter, too. I bet all those gifts made his day! :) Yes 6 years goes by so fast. What a happy house for a hampster! Happy Birthday Pierce!! I had hamsters when I was young too, they are great pets.. but do keep him away from the cat! That happened at my house too... ugh. I just Love their happy little faces, cute Gerbil to. long may he or she live! :) adorable. Happy birthday to your boy! Looks like he and Jubal have bonded fast. Awe Happy birthday Pierce. Jubal is so cute and fuzzy. 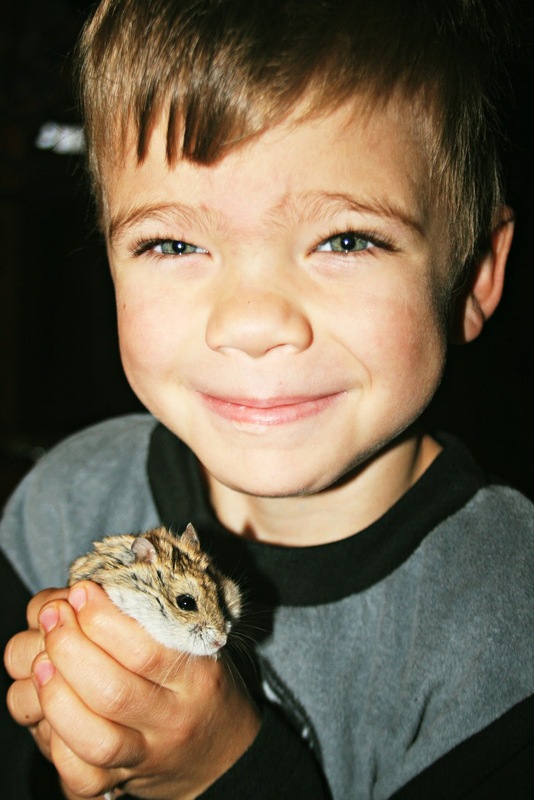 I can remeber all four of my children having a hamster at one time. Oh, how fun that was. I was just looking at them at Petco remembering a first purchase.We had rabbits, cats,fish, and dogs also. How sweet! Happy birthday to your big boy, and omg, that first shot of him is JUST PRECIOUS. And? He looks so much like you there it's crazy!! Love!! Haaaaaaaa, your cat is named Baxter. I love it. Oh Pierce's face is precious with joy. sooooooooo cute! Happy Belated Birthday to Pierce! Jubal is so cute! Haha! Great photos and a nice story. Age 6 is special. I was into model cars that had to be glued together. Amazingly, I didn't create the mess you might expect! Happy Birthday!!!! Awwww Jubal is so cute! Looks like Pierce had a very happy 6th birthday! we always had hampsters and they always got out of their cages. they are little houdini's!! Your son is adorable. And so is the hamster! Sweet shots of your precious one. Jubal is pretty cute. Glad Pierce had a great birthday! Kitty looks like he want Jubal bad.... and not to befriend either. I think he has lunch in mind. Awwww! Pierce and Jubal are so cute!